LG 55LM760T review | What Hi-Fi? 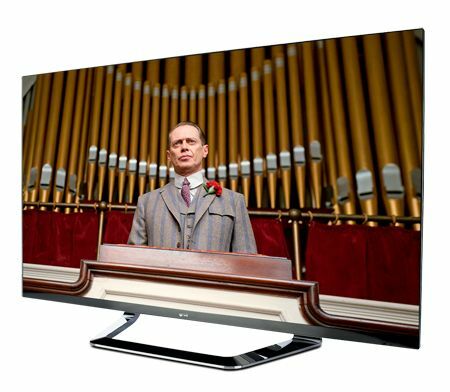 For a 55in set, the LG 55LM760T's £1700 price tag is something of a steal. Haul the slender frame out of the box and our impression doesn’t change. A barely there bezel frames the screen and it’s just under 34mm slim. A smart, angular frame completes a package that’s every bit as impressive aesthetically as any other 2012 TV on the market. Sitting in the middle of LG’s 2012 range, this is a Full HD, passive 3D set and comes with seven pairs of 3D glasses. There are two remote controls: a standard, button-packed unit and a small, curved ‘magic remote’ with a smooth click wheel control. The usual selection of connections are here, with four HDMI inputs, three USB inputs – you can connect a hard disk drive to make a basic PVR – and a digital optical audio output. Integrated wi-fi allows you to access a huge number of apps including BBC iPlayer, YouTube, LoveFilm, Blinkbox and an internet browser. LG 55LM760T: PerformanceThe Freeview HD tuner looks pretty good. There’s a decent level of detail, it’s reasonably free from digital noise and motion is handled smoothly. The very best deliver only a touch more punch and colour. Full-bodied sound is a bonus. Switch to DVD or Blu-ray and it’s more of the same. Black levels on this LED backlit LCD can’t match the best and we’re not 100 per cent happy with fast motion, but in isolation it’s detailed, colourful and reasonably sharp for such a big screen. If you want a monster TV on a budget that’ll deliver smart TV and 3D for all the family, this is hard to beat – only the best around pip it on picture performance.